I’ve been very good. I had a copy of this book sitting neatly on my desk and I read it well over a month ago. Review a book too soon though and everyone will forget about it when the title hits bookstore shelves months later. And since Selznick’s latest doesn’t come out until March I was trying to keep a lid on it. I think I did very well indeed and I deserve a treat. And that treat shall be the chance to review the book properly at long last. My logic may be faulty, but it’s all I have. No one can really summarize a book any better than the author proper. 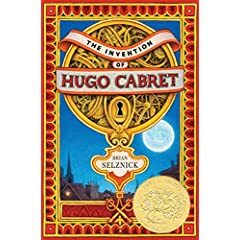 So what is, “The Invention of Hugo Cabret” anyway? “… this is not exactly a novel, and it’s not quite a picture book, and it’s not really a graphic novel, or a flip book, or a movie, but a combination of all these things.” In short, what you have is a book that can’t really be lumped into a single genre. With the rising popularity of the graphic novel, authors have been looking at how to let the visual elements of a given story complement the text. Some will weave graphic novel elements in and out, panels on one page, text on another. Others prefer a kind of “Captain Underpants” melding with cartoonish pictures. And while all these books are fun reads, none of them have ever really had the (for lack of a better word) gravitas you’d find in a classic text-only children’s novel. Until now, that is. “Hugo Cabret” is a risk. A 500+ page book that’s told just equally by pictures as it is by text. It is also like nothing you've ever seen before. No other children's book has even come close. Without Hugo Cabret, none of the clocks in the magnificent Paris train station he lives in would work. Though he’s only a kid, Hugo tends to the clocks every day. But there’s something even more important in the boy’s life than gigantic mechanics. Hugo owns a complex automaton, once his father's, that was damaged in a fire and it is his life’s goal to make the little machine work again. To do so, he’s been stealing small toys from an old shopkeeper in the station. One day the man catches Hugo in the act, and suddenly the two are thrown together. Coincidences, puzzles, lost keys, and a mystery from the past combine in this complex tale of old and new. The story is told with pictures that act out the action and then several pages of text that describe the plot elements. The final effect is like watching a puzzle work itself into clarity. Selznick is juggling so many different elements and inspirations in this book that you honestly expect the result to be a muddle. Okay. So you have a story involving old-timey movie-maker Georges Melies (he's the old shopkeeper) whose image in this book was modeled on children’s book author Remy Charlip (also an influence). You have an automaton, the history of automatons, and the history of movies themselves. There are photographs of old films mixed in with some bizarre sketches. Then you throw all of this together and add in a story about a boy, a girl, a one-eyed man, toys, keys, and a train station. Boom! Instant book. The fact that this title ISN’T a mess is downright bizarre. They say that the mark of a good musical depends on how well the songs advance the story’s plot. You can’t just have your characters burst into song and then act like nothing ever happened. The case could be made too for books like “Hugo Cabret”. If there is a picture in this story, it has a purpose. Nothing here was included on a whim. When the book breaks from word to image, it has to be done just right. It has to feel natural. At one point in “Hugo Cabret” our hero is nearly trapped by the Station Inspector. The book reads, “The Station Inspector saw the bandages and loosened his grip, at which point, like a wild animal, Hugo escaped.” What follows is a thirty-six page chase sequence that comes across like a black and white film. And the real star of this show, in the end, is Selznick’s art. The man is doing things with mood and lighting that give the book just the right mysterious feel. Selznick’s pictures are done, for the most part in graphite with plenty of shading involved. At the same time, he knows how to get the viewer involved in what they are seeing. There are moments where the “camera” is zooming in on a particular shot and instantly gets your attention. In the book’s opening, we begin with a shot of the moon that pulls back and follows young Hugo. Then suddenly, we see Hugo look over his shoulder and the picture hits you hard. We’re on the eighteen or nineteenth page and already we’re deeply interested in what we're seeing. We want to know more. Hugo does have some magnificent bags under his eyes at times, and he and the old man's granddaughter Isabelle sometimes look rather similar, but on the whole it’s hard to find anything wrong with what Selznick has chosen to place in this book. Admittedly, not everything works as smoothly as it might. Selznick has to keep everything in this story moving constantly. Nobody wants to see picture after picture of people just sitting around and talking, after all. So really, the downside to this kind of book is that some degree of characterization and description is lost in favor of plot and theme. The kids in this book go from liking one another, to hating, to liking again in a manner that feels a tad awkward. Motivations are sometimes murky, even if they’re explained later down the line. But the allure of this book for kids can’t be stressed enough. Selznick is most familiar to children, at this point in time, because of his covers of such Andrew Clements books as “Frindle” and “School Story”. When kids see a Selznick cover, they know to grab it. Children who like big thick Harry Potter-sized tomes will pluck the multi-colored “Hugo Cabret” from its shelves without hesitation. Ironically, though, this is a perfect title for reluctant readers. Though the page count will scare off some, those who’ve been shown the insides will appreciate this unfamiliar form of storytelling. Unlike a graphic novel or a picture book, however, you can’t understand “Hugo Cabret” through pictures alone. You can try, I guess, but you end up with a very different tale from the one Selznick has written. The nice thing is that in spite of all the complicated details and influences at work here, the story itself is straightforward and interesting. Extra kudos for the spine of this title, by the way. Publishing houses too often forget that sometimes the spine of a book is all a customer is ever going to see of a title. And if there were a Best Spine of the Year Award, I think I know who the winner might be. The spine and back are of Hugo’s face, lit from the side. Just his left eye and part of his cheek are visible on the spine, with the title, author, and publisher information shoved to the bottom. It’s haunting. Does haunting sell? You bet your sweet bippy it does. It’s hard to say whether or not this kind of format would work with any other book. Really, it’s the fact that so much of “Hugo Cabret”’s plot revolves around black and white movies that allows this book to jump so easily between image and text. If you did something similar with a story about, oh I dunno, a lion in the jungle, it might feel odd. But given Selznick’s subject matter and his careful use of both his own illustrations, movie stills, and sketches, the book holds together. The writing is second to the illustrations, but it’s still heads and tales better than most of the crummy kidlit you’ll stumble across. Sometimes you hold a book in your hands and it feels like a classic from day one. “The Invention of Hugo Cabret” radiates that feeling. On shelves March 1, 2007. In a word, I found the book awesome. I've got a slew of other words, too (different, fun, interesting, clever, dazzling, and more). I think another big plus is, well, it's not "re-readability" but it's the fact that after reading, you want to go back and study some of the drawn sections more closely... which leads you to want to find things in the text... which sends you back to different pictures. Goooood stuff! March? Waah. I'm dying to get my hands on this book! I think the book is an awesome achievement and had planned to say my piece at my own place, but closer to when it was released. Which brings up a question i've been mulling: How early is too early for a review? On one hand I can see wanting to get out in front of the crowd, to say you were there first and not be influenced by others. On the other hand I sense a disservice to others who might be interested but will either forget or become frustrated in the wait. I found the book at the precipice of the gap between graphic novel and fiction. An excellent step in giving younger readers some of the necessary vocabulary for reading visuals, as opposed to the more passive approach by movies and some of the lazier graphic novels. I've often wondered how soon is too soon myself. This book in particular had me wondering. I figure that I can always repost a review on the date of the book's actual release, but really it is better to wait in general. The problem is when the book is as cool as this one is. You just wanna review it for all it's worth while it's still fresh in your mind. But should you necessarily post it at that time too? It's a puzzle. I don't have an answer, but I'd love to know what others think. can't wait to get lost in this one! I admit that I am likely to lose it in the shuffle of so many good books if I have to wait 3 or 4 months, so I would prefer a reminder. I think that posting early, and then reposting a link back to it when it's released is a wonderful idea. And, yes, there's always the pre-order. This one is beautiful in so many ways -- its cover, its illustrations, and its story. Bravo to Mr. Selznick for a great book. And I love the idea of a book spine award. 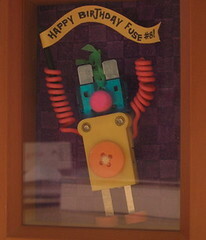 Perhaps that can be the new kidlit award in 2007/8? Tinkering With "The Tin Men"
Care For Another Best Books List?